This piece of writing is to fulfil the #EdBlogNZ challenge that has been set. As my understanding of Whānaungatanga grows so does my understanding of sustainability. Therefore I will also be focusing more on Travelwise at Newmarket School and the part we play on Global Warming. I look after my parents and so have added them to my goal as a focus that I had promised to make their golden years, just that, golden. I am writing both their stories starting with dad. I have been accepted into the Language Teaching Consolidation Programme. One criteria is to learn and teach a new language. I have chosen Mandarin. At the same time this is Whānaungatanga because predominantly the children I work with are Mandarin speakers and one positive way of building relationships is speaking the language of the children I teach. I also know the challenges of learning a new language so that I may better emphasise with them. This year I am also the lead teacher for the ALLIS cluster for Newmarket School. This is a ministry initiative ‘Asian Language Learning in Schools.‘ Our school is part of the Epsom/Remuera group. Keep focusing on a community of learners. I now have several I am leading or involved with at administration levels. Keep my eye on my FitBit Dial and aim for a minimum of 10,000 steps per day. Keep walking to and from school. At the moment I have recently shifted back home after having renovations and my steps are not where they were. And you what will you keep as target practice for 2016? Who’s voice is being silenced? Who do we silence when we “collaborate” and “connect”? Trust Pam Hook to ask this question. I recently read a blog post where Pam commented and asked this question. Those of you who know me, connecting, collaborating, creating and sharing are my ongoing personal teacher inquiry. So much so that I have literally made an online name for myself with doing all this “connect” and “collaborate” online stuff..
Pam asked an interesting question and one that I am sure like me you had never really thought about or really cared about and you have been hell bent on gathering followers or creating virtual communities to have teachers work together because you realise how much of an impact this has on teachers learning. I know the internet is the main form of communication in this 21st Century and who does not have a cell phone? Correct? But it is still a valid question. We are extremely lucky at my school because we have a strong school leader who has always been forward thinking in her approach. Such as giving the teachers the tools. So we all had an iPad 2 when they first came out and have since been updated and senior teachers were given an iphone with a school plan. She gave us all a chrome to play with because this was a tool we would be using with our children. We can even choose what kind of a TELA we want. Yet I grew up in a 3rd world nation and I speak to other teachers who do not have the same access to technology or professional learning as what we have at Newmarket School. I visited 13 countries in 11 weeks and spoke with teachers who many do not have the same opportunities and access that we have here in New Zealand. I visited many teachers whose classes do not have internet access. For teachers in New Zealand I query their access because TELA has been available since 2003 and access to the internet really took off in 2004 when the first waves of schools were snupped. Name a new Zealand teacher who has not been part of an ICTPD contract in the past 10 years. Our Ministry of Education has poured millions of dollars into our digital learning. So again whose voices are being silenced through connection and collaboration? I am aware of the challenges that some outlying schools have to access. They do not yet have broadband and are still reliant on dial up. But I believe that if you want access bad enough somehow you can find a path. Even if you pay for access yourself. When I think back to schools that I have been at where I have had to pay for first of all for my own laptop and then my own lease or when when I was an early adopter of technology and bought dial up at phenomenal costs. Online I notice that my twitter PLN are made up of mostly European educators. I find the Maori and Pasifika Educators appear to gravitate to Facebook. As for Asian educators I talk to them on WeChat. So I guess if I am looking for certain voices then as an educator I must move in the social media that has greater numbers. When I have run online professional learning for educators I particularly target voices that are often very quiet. I am much more conscious of this then I have ever been because of my work with Pam. Yes using digital communication can silence when we “collaborate” and “connect”. The ones taking part in connecting and collaborating online can have their voices amplified like being the only ones holding a microphone at a face to face meeting. Yet what about our children who do not yet have access to home broadband because the extra cost is a luxury that is over and above feeding a family? That and even having a device to access communication with. Yes we still have those. I also think about the work I do with my Samoan colleagues who insist on face to face meetings because, ‘This is the way we work best.’ I encourage digital communication but that is on ongoing journey I have always had. I also find that in the face to face meetings I am the voice being silent. I am used to having my voice amplified with media that sometimes I feel frustration in the noisy face to face meetings. I feel frustration at the speed of getting things done because I am so used to getting things done at super speed using online communication. I am the educator who amplifies our Samoan voices digitally and I do so willingly because I know some can be very quiet online. My citizenship question to you is the same as Pam’s. Who do you silence when you “collaborate” and “connect”? I should have begun with this quote taken straight from Tahu’s Blog Post on Whānaungatanga. Me hui kanohi ki te kanohi kia rongo i te mauri o te tangata!’ It is important to meet face to face, eye to eye, breath to breath to get a full understanding of the people we are working with. ‘Ko te reo te mauri o te mana Māori. The language is the life force of the mana Māori.’ Sir James Henare, 1985. Matariki signals the dawn of the Maori New Year and this year begins 20 June and ends on the 19th of July. Matariki is a time for reflection and where we are up to on our learning journey. Matariki is about whanaungatanga and the chance for our school community to come together to plan, collaborate and celebrate this important event. Matariki is a time to retell stories and to revisit traditional games and crafts. Matariki is a time to set new goals and make new connections. Matariki is a time to focus on Te Reo and the upcoming Maori Language week that begins on the 29th of June. 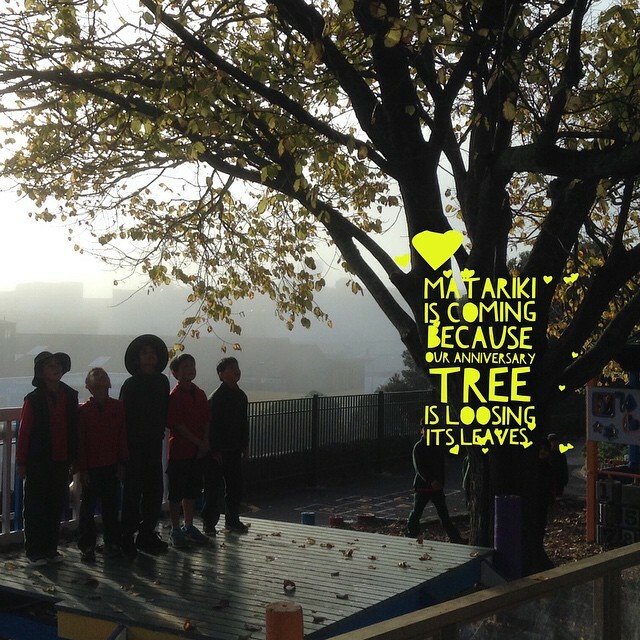 I can tell Matariki is close in season when our school centenary tree loses its leaves. I see Tui making a regular appearance around school. They come for the black whauwhaupaku berries and for the the ripe Puriri fruit. At our school the rainbow is a regular sight and we get the torrential rains just like when it rains in Samoa. Often the mornings are misty and our grounds become soggy so we have to look for alternative lunchtime activities for the children. Our school gardens are in the last stages of harvest and the gardening club plan for the next cycle of planting. The children are usually excited because it is also at this time that they prepare for our annual Matariki disco. Sometimes events can suddenly happen to make you sit up and take notice. Friday was no exception. We had an interesting day as a flow of speakers came through our school as part of early Matariki celebrations. While the school was at assembly the first groups arrived and were greeted by our principal and deputy principal in a whakatau because our speakers and workshop presenters were immediate and extended family members of our school and local community. Eilleen our deputy principal and of Te Rarawa descent organised the day as part of the Te Whanau Kotahitanga Maori enrichment programme and we were given a shared doc to choose activities that we could take some of our children to. Two relievers were brought in to tag teachers in and out of class so that they could take part and they could take some children from their class to attend the planned sessions. During this same time our senior school had their Friday Discovery day where several children were part of the planned Masterchef cook off and today was their semifinals. At lunch time I had my usual Travelwise lunchtime group meeting where I had aimed to complete work for an upcoming global sharing celebration that my group are involved in as part of the ‘Week in the Life Project.’ We have worked towards this event for nearly two terms as part of preparation for an experience for learning student project I have planned to launch in terms 3 & 4. The challenge I had is that several of my Travelwise children were involved in all three events. Sometimes events like this can throw all planning out the window. So after speaking with the children in the morning I readjusted on the day and worked with only one Travelwise student instead of my ten to get a model up for the rest of my group. Over the next week I will find time to support the others as they complete their part to share with our global audience via skype over the next few week. As I worked with my usual English Language groups to complete work the computer system played up. I wanted to complete a piece of digital art with a few children but did not finish this. In between children I attended a few sections of the Matariki activities. I attended three activities in the middle block. In the afternoon, I had agreed to share my journey about receiving my malu and missed seeing the other Matariki activities then too. I made sure that I finished a little earlier so that guests who had come to hear me would be back in time for the whaikōrero with Eilleen. Our Maori students and teacher need acknowledgement of who they are and under the Treaty of Waitangi, they have the right to come together to celebrate their uniqueness with role models and senior members of their community. Friday was no exception because at our school we had a range of powerful role models join us for the day to mentor, guide and share their gifts with some of our students. On Friday our Maori teacher and students took charge of the day. They had their voices heard and had the opportunity to influence others. So on reflection Matariki is about whanaungatanga and the chance for the whole school to come together to plan, collaborate and celebrate this important event on the Maori calendar. We have focussed on whanaungatanga in the past with great success as can be seen shared on our school Matariki wiki. I also believe that an event like this allows us to reflect where we are up to on our commitment to the Treaty of Waitangi. To find out more about Matariki, visit our digital story on Issuu . To find out about whanaungatanga visit our Matariki Wiki. To find out about Maori enrichment at Newmarket School, visit Te Whanau Kotahitanga’s blog. 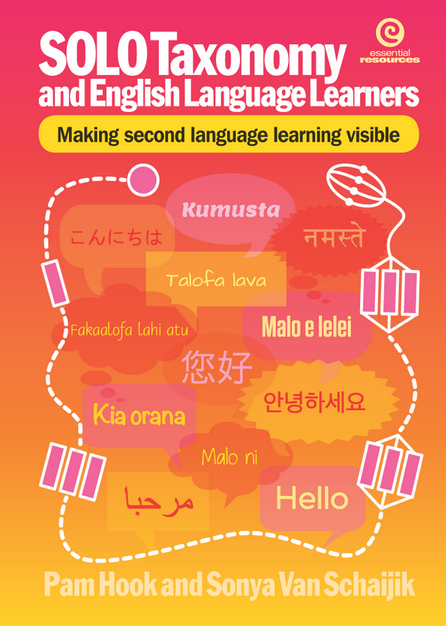 Check out our SOLO Taxonomy Book about making second language learning visible. TeachMeetNZ from Ministry of Education on Vimeo. Talofa lava, Kia Ora. My name is Sonya Van Schaijik . I am a teacher at Newmarket School in Auckland New Zealand. I am a mother of two grown sons and the caregiver of my parents in their winter years of life. I am a Coreefellow 2012 and build and maintain the efellows wiki. I blog regularly on connecting, collaborating, creating and celebrating in education. I host the #TeachMeetNZ google hangout celebrating New Zealand educators once a quarter. My TeachMeetNZ story recently featured on The Future Focussed Site on TKI. Some of my recent sharing has been interviewed by Pete Hall for the Point of Learning podcast. I shared leading teachers to share their practice. I was invited to share the #TeachmeetNZ story on the VLN enabling e_learning professional learning community. You can check out the webinar here. Personalising PLD using social networks. Recently I helped set up a curated blog site for New Zealand educators to share their learning. You can check that out here. www.edblognz.blogspot.com. Together with Nathaniel and Alex we monitor and maintain the site. Contact me on twitter if you are interested in sharing your story.